The OnePlus One is a legendary device. Moreso for people who care about third party development – the phone has officially received CyanogenOS, OxygenOS, HydrogenOS, MIUI 7, Sailfish OS and even Ubuntu. All of these ROMs (OSs) are in addition to the hundreds of other unofficial ports and ROMs that enthusiasts in the forums build and share. And now, just a few days after Google released Android 7.0 Nougat for supported Nexus devices, you can be sure that the OnePlus One would run it in some form or the other. 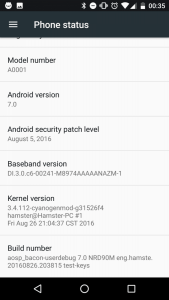 And run, it does, for XDA Senior Member updateing has posted an experimental, unofficial build of Android 7.0 for the device. The build is to serve more as a first tasting session of the new dessert rather than be a replacement for your daily driver. You could use it as a daily driver if you alright with using an experimental build since all basic hardware functionality is present. But there are a few bugs present, like issues with video hardware encoding that causes camcorder to fail. The default input method is broken as well, so you will have to adb install your keyboard of choice. The firmware and proprietary blobs are lifted from Marshmallow, so there’s likely to be a fair few more issues that you’ll encounter in your daily use. To download the ROM, for discussions and for more screenshots, head on over to the forum thread! For a first release for a phone that is not going to receive official Nougat from its OEM, the build is impressive as it comes within a few days of the source code being dropped. We can expect other AOSP builds for the device to pick up the baton in terms of features and stability. Until then, enjoy your first taste! 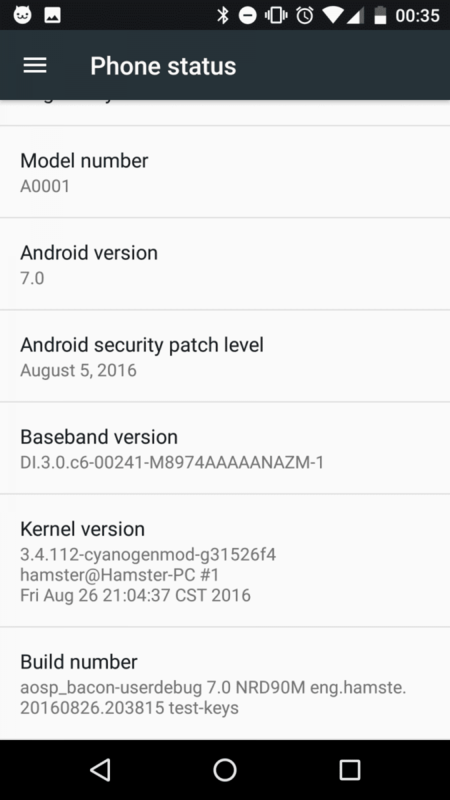 What are your thoughts on the OnePlus One receiving Android 7.0 Nougat unofficially? Let us know in the comments below!